Hacienda el Carmen Hotel & Spa is the ideal place to relax, enjoy nature, and unwind from the everyday hustle and bustle. Located in Ahualulco de Mercado, the hacienda is surrounded by blue agave farms, the raw ingredient of Mexico's famous tequila. The hacienda dates back to the 16th century when the Spanish Crown bequeathed the land to Francisco Merodio de Velasco. It was passed down through generations until it ended up in the hands of a widow with no children, Francisca Figueroa. She decided to give the land to the Carmelite monks, who built the main building and its enchanting courtyard in 1722. The Prior, however, did not want to turn it into a monastery. Instead, he sent the earnings from the cattle and crops to Guadalajara to finance the construction of the famous Convento del Carmen. With the emergence of Benito Juárez and the Reforma in 1856, the Carmelites were expelled and the Convento del Carmen became the Ex-Convento del Carmen (as it is known today). Thereafter, the hacienda passed through many owners until it was abandoned, left to neglect, and eventually auctioned off. 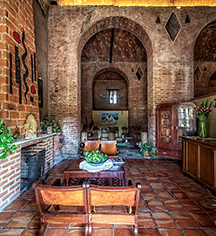 The Baeza Family purchased the property in 1964 and renovated it into a country house, converting it into a luxury boutique hotel, restaurant, and spa in 2001. The 28-guestroom Hacienda el Carmen Hotel & Spa features a full-service spa, outdoor pool, fitness facilities, complimentary WiFi, and an authentic and traditional Mexican restaurant. Guest can choose from various activities, including golf, paddle board, fishing, and mountain biking. The hacienda has 160 hectares of farmland, where it raises sugar cane and corn, and specialize in growing large, beautiful bell peppers for export. The hacienda is close to the Agave Landscape and Ancient Industrial Facilities of Tequila, a cultural UNESCO World Heritage Site. 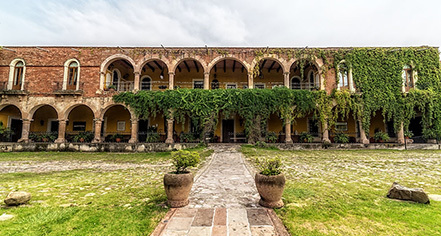 Hacienda El Carmen Hotel & Spa, a member of Historic Hotels Worldwide since 2016, dates back to the 1722. The movie, Tequila, historia de una pasion, was filmed at the hacienda in 2008. Starring Unax Ugalde, Daniela Schmidt, and Angélica Aragón, the movie debuted at the Oaxaca FilmFest in November 2010. Hacienda el Carmen Hotel & Spa is the ideal place to relax, enjoy nature, and unwind from the everyday hustle and bustle. Located in Ahualulco de Mercado, the hacienda is surrounded by blue agave farms, the raw ingredient of Mexico's famous tequila. Learn more about the History of Hacienda el Carmen Hotel & Spa .